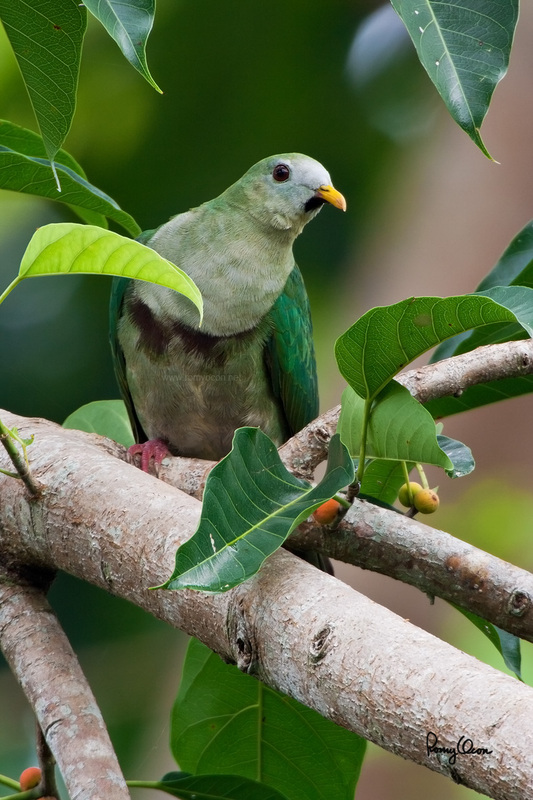 This uncommon, medium size fruit-dove is found in most Philippine islands. It is about 10 inches total length, and is termed near-endemic to the Philippines because it also ranges in an island off the coast of Taiwan. This individual was feeding in the canopy of a local fig tree at Mt. Makiling when I had the opportunity to photograph it. I had to mount a 2x TC on the Sigmonster to fully fill the frame of the Canon 350D. Before the advent of Live View, focusing manually through the dark viewfinder was quite a challenge. 1600 mm, f/16, ISO 400, 1/60 sec, manual exposure in available light, 475B/3421 support, uncropped full frame resized to 1200x800.